Also recognized by its name of dolphinfish the mahi-mahi is largely found swimming close to the water’s surface in temperate and tropical waters. Being a ray-finned fish, the fins are comprised of webs of skin with spine support. Mahi-mahi belongs to the same family as the pompano dolphinfish. The curious name of the fish is derived from the Hawaiian language, where the name translates to “very strong”. Like the wahoo, the mahi-mahi goes by different names in different countries. Maverikos, dorado, rakingo, and lampuga, are a couple of examples of its various names. 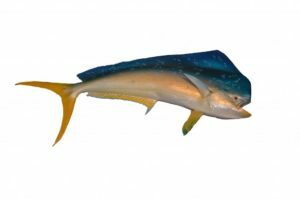 If the multitude of names weren’t confusing enough, here is something else that might confuse you: mahi-mahi have no relation to dolphins even though they go by the name of dolphinfish. Both male and female mahi-mahi stand out thanks to their magnificent display of various hues, from gold on the sides to the rich blue found on the pectoral fins. The fish is able to live for roughly five years.